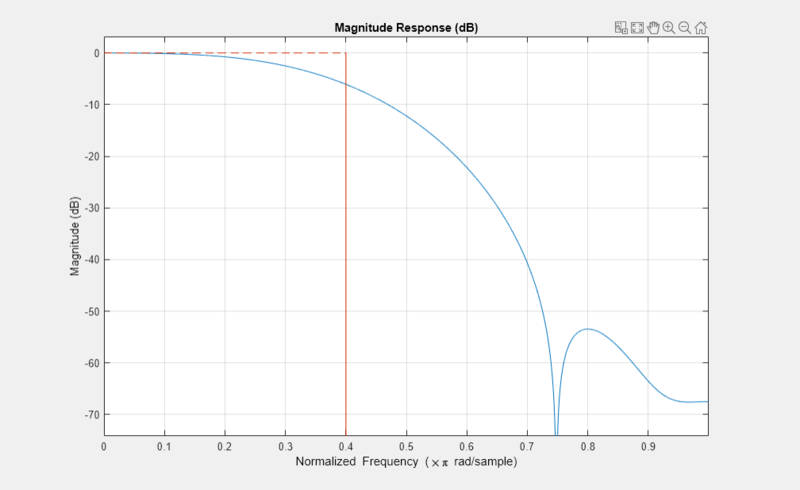 The dsp.FIRFilter System object™ filters each channel of the input using static or time-varying FIR filter implementations. Create the dsp.FIRFilter object and set its properties. fir = dsp.FIRFilter returns a finite impulse response (FIR) filter object, fir, which independently filters each channel of the input over time using a specified FIR filter implementation. fir = dsp.FIRFilter(num) returns an FIR filter System object, fir, with the Numerator property set to num. fir = dsp.FIRFilter(Name,Value) returns an FIR filter System object, fir, with each property set to the specified value. Specify the filter structure. You can specify the filter structure as one of Direct form | Direct form symmetric | Direct form antisymmetric | Direct form transposed | Lattice MA. Specify the source of the filter coefficients as Property or Input port. When you specify Input port, the filter object updates the time-varying filter once every frame. This applies when you set the Structure to Direct form | Direct form symmetric | Direct form antisymmetric | Direct form transposed. Specify the source of the Lattice filter coefficients as Property or Input port. When you specify Input port, the filter object updates the time-varying filter once every frame. This applies when you set the Structure to Lattice MA. Specify the filter coefficients as a real or complex numeric row vector. This property applies when you set the NumeratorSource property to Property, and the Structure property is set to Direct form, Direct form symmetric, Direct form antisymmetric, or Direct form transposed. Specify the reflection coefficients of a lattice filter as a real or complex numeric row vector. This property applies when you set the Structure property to Lattice MA, and the ReflectionCoefficientsSource property to Property. Specify the initial conditions of the filter states. The number of states or delay elements equals the number of reflection coefficients for the lattice structure, or the number of filter coefficients–1 for the other direct form structures. You can specify the initial conditions as a scalar, vector, or matrix. If you specify a scalar value, the FIR filter object initializes all delay elements in the filter to that value. If you specify a vector whose length equals the number of delay elements in the filter, each vector element specifies a unique initial condition for the corresponding delay element. The object applies the same vector of initial conditions to each channel of the input signal. If you specify a vector whose length equals the product of the number of input channels and the number of delay elements in the filter, each element specifies a unique initial condition for the corresponding delay element in the corresponding channel. If you specify a matrix with the same number of rows as the number of delay elements in the filter, and one column for each channel of the input signal, each element specifies a unique initial condition for the corresponding delay element in the corresponding channel. Specify the coefficients fixed-point data type as Same word length as input or Custom. This property applies when you set the NumeratorSource property to Property. Specify the coefficients fixed-point type as a signed or unsigned numerictype object. Specify the reflection coefficients fixed-point data type as Same word length as input or Custom. This property applies when you set the ReflectionCoefficientsSource property to Property. Specify the reflection coefficients fixed-point type as a signed or unsigned numerictype object. This property applies when you set the ReflectionCoefficientsDataType property to Custom. Specify the product fixed-point data type as Full precision, Same as input, or Custom. Specify the product fixed-point type as a signed or unsigned scaled numerictype object. Specify the accumulator fixed-point data type to Full precision, Same as input, Same as product, or Custom. Specify the accumulator fixed-point type as a signed or unsigned scaled numerictype object. Specify the state fixed-point data type as one of Same as input, Same as accumulator, or Custom. This property does not apply to any of the direct form or direct form I filter structures. Specify the state fixed-point type as a signed or unsigned scaled numerictype object. Specify the output fixed-point data type as one of Same as input, Same as accumulator, or Custom. Specify the output fixed-point type as a signed or unsigned scaled numerictype object. y = fir(x) applies an FIR filter to the real or complex input signal x to produce the output y.
y = fir(x,coeff) uses the time-varying coefficients, coeff , to filter the input signal x and produce the output y . You can use this option when you set the NumeratorSource or ReflectionCoefficientsSource property to Input port. Data input, specified as a vector or a matrix. When the input data is of a fixed-point type, it must be signed when the structure is set to Direct form symmetric or Direct form antisymmetric. 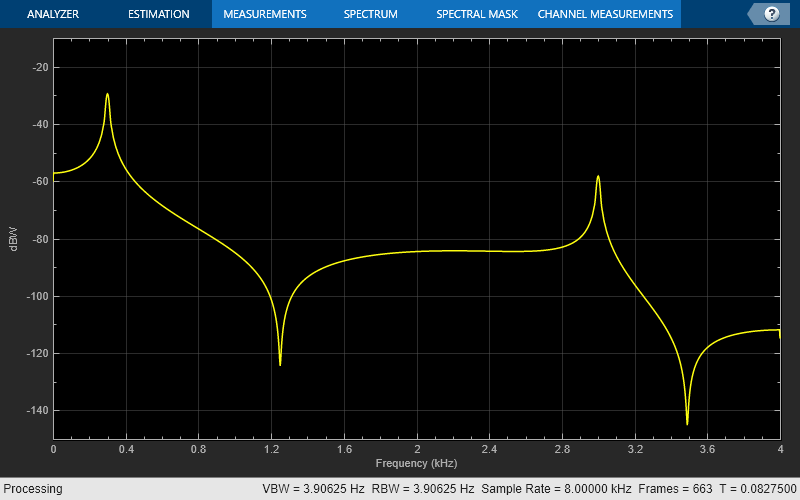 The FIR filter object operates on each channel of the input signal independently over successive calls to step method. This System object supports variable-size input. Time-varying filter coefficients, specified as a row vector. The data and coefficient inputs must have the same data type. Filtered output, returned as a vector or a matrix. The output has the same size and data type as the input. 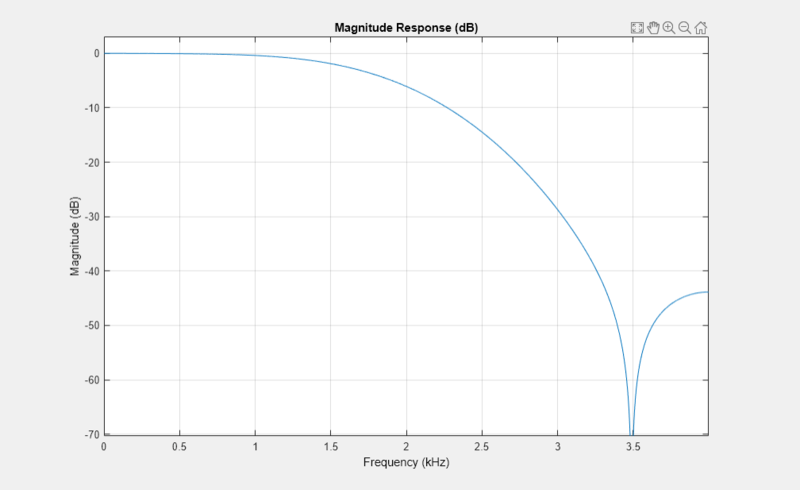 Use an FIR filter to apply a low pass filter to a waveform with two sinusoidal components. Design an FIR filter as a System object. This can also be achieved by using fdesign as a constructor and design to design the filter. This object implements the algorithm, inputs, and outputs described on the Discrete FIR Filter block reference page. The object properties correspond to the block parameters. Only the Numerator property is tunable for code generation.